Well known as a specialist in early keyboard instruments, Douglas Hollick studied organ with Peter Hurford whilst organ scholar at Hull University, and subsequently with Marie-Claire Alain in Paris and both organ and harpsichord with Gustav Leonhardt in Amsterdam. He has played widely both here and abroad, including the 1991 Prague Early Music Festival, and in Melbourne, Sydney, and the 1992 Fremantle Bach Festival in Australia. Visits to the Czech Republic continued for some years, with teaching and concerts in Prague, Brno and Ostrava, a member of the jury of the 1996 Organ Competition in Opava, and two Czech Radio recordings, the latest in 2007. In 1999 he played in the Dolní Lukavice Haydn Festival in Bohemia. In visits to Germany he has played organ recitals in Stuttgart, and on the Silbermann organs in Dresden and Pfaffroda, and in 2004 and 2005 on the restored 17th century organ of St Johannis, Hamburg-Neuengamme. Elsewhere in Europe have been recitals in Roskilde Cathedral and Helsingør in Denmark, and Helsingborg in Sweden, where he played in the Buxtehude Festival of 2007. 2003 and 2011 saw return visits to Sydney in Australia, and the Glebe Festival, as well as recitals in Western Australia. A particularly memorable occasion was a performance of Bach's Goldberg Variations in the 2008 St David's Festival in Wales to a large and appreciative audience in the Cathedral. Other concert venues have included Westminster Abbey, St Paul's Cathedral and St John's Smith Square in London, Winchester, Ely, Carlisle and Chester Cathedrals, Southwell Minster, and in Trinity, Clare, Wolfson, Girton, Newnham, Churchill and St Catharine's Colleges Cambridge, The Queen's College Oxford, together with Hull, Southampton, Nottingham, Warwick and Edinburgh Universities. Festival performances include the Edinburgh, King's Lynn, Finchcocks and Gravity Fields Festivals. 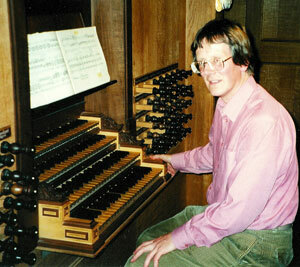 He teaches organ, harpsichord and performance practice in Clare and Trinity Colleges Cambridge. A wide repertoire includes major works like the Goldberg Variations and Clavierübung III of Bach, and also works by lesser known composers such as Kuhnau, Benda, Moyreau and Séjan. Programmes often have a particular theme (such as Fantasy, inebriation and madness), and mixed harpsichord and organ programmes can be particularly interesting. The musicality, authority and virtuosity of Douglas Hollick's playing ensure that his concerts are always stimulating and enjoyable. For harpsichord recitals and chamber music in the UK, he uses his own 1989 copy of the 1711 Pierre Donzelague instrument. 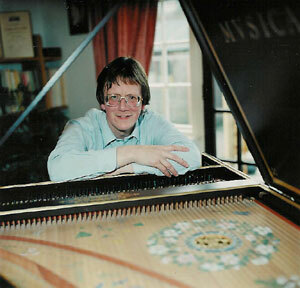 Educational work is also undertaken with this instrument - Douglas Hollick made early keyboard instruments for 15 years up to 1990 in parallel with his playing, so he is uniquely qualified in this respect. Masterclasses can be arranged to link with a particular concert programme, giving students a deeper insight into the music by being able to listen to performances as well as play themselves. Clavichord is now becoming another regular concert instrument with the acquisition of the 1909 Dolmetsch Chickering instrument from Christopher Hogwood's collection. Whilst a more intimate venue is ideal, this instrument has quite a big voice and projects well. A recording of Haydn sonatas from the 1780s is planned on this clavichord, which is a perfect match for this music. Private consultation lessons can be arranged either in Cambridge or at home, where apart from the harpsichord, there is also a Klop two manual and pedal chamber organ, a copy of an early 17th century German triple fretted clavichord, a 1909 Dolmetsch Chickering clavichord after Hoffmann 1784, two early English pianos by Broadwood, a square of 1790 and a grand of 1809, and a Paris Erard grand of 1841. Illustrated lectures and lecture recitals based around harpsichord, the 1809 grand or the 1909 clavichord are available, and make for a different and fascinating variation on the usual concert programmes. Douglas Hollick taught weekend residential courses for many years at Madingley Hall for Cambridge University, so has a wealth of experience in this area. Chamber music with various other artists under the group name Chameleon, presents duo and trio sonatas with either harpsichord or organ, and the possibility of theorbo as well. 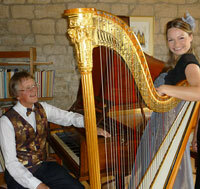 A very different strand of repertoire is late 18th and early 19th century music for harp and piano with the Dussek Duo. Harpist Eleanor Turner plays a beautiful early 19th century Paris Erard double action harp which is a perfect foil to the 1809 Broadwood grand. Duos by C P E Bach, Mozart, Dussek, Naderman, and others are interspersed with piano and harp solos, and make unusual and enjoyable programmes. A year 2000 Churchill Fellowship enabled Douglas to pursue further research into the keyboard instruments from the period of Buxtehude and the young Bach, and to assess the performance implications of the acoustics in churches where Buxtehude worked as organist. His project took him to North Germany and Denmark for a month, visiting such places as Hamburg, Lübeck, Lüneburg, Copenhagen, Roskilde, Helsingør and Stralsund, visiting museum collections and historic organs. The results of the trip have been seen in Douglas' playing, teaching and writing, and in the 2002 recording called Buxtehude, master and pupil made in Buxtehude's church in Helsingør. 2007 saw the release of another CD dedicated to this period and area of repertoire - a tercentenary tribute to Buxtehude called Music of the Baroque avant-garde which presents free works for harpsichord and organ and is accompanied by a substantial essay which can be found on the Riverrun website. This and Douglas' other Riverrun recordings and articles for various magazines formed part of the Birmingham Conservatoire submission to the 2007 Research Assessment Exercise, and continuing research in this area resulted in a trip to Malmö in Sweden in 2008 to see the important mid-17th century organ in the museum there. The 2017 recording Bach: under the influence continues this strand of research and recording focused on the organ music of North Germany, this time based around research by Dutch organist Piet Kee into Number and Symbolism in ostinato organ works of the 17th and 18th century. 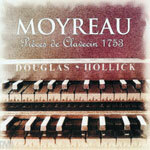 Recordings available from Riverrun Records ( www.rvrcd.com ): World Première recording of harpsichord and organ works of Christophe Moyreau (RVRCD 60). This is enigmatic and wonderful music of mid-18th century France, superbly performed on Douglas Hollick's own Donzelague harpsichord and the Metzler organ of Trinity College Cambridge (by kind permission of the Master and Fellows of Trinity College). Buxtehude, master and pupil (RVRCD 67) contains organ music by Buxtehude, his teachers Lorentz and Scheidemann, and his pupils Leyding and Bruhns. 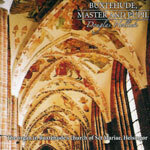 Recorded on the Marcussen reconstruction of Buxtehude's organ in the church of Sct Mariae, Helsingør, where Buxtehude was organist from 1660-1668, this recording illustrates many aspects of Douglas' research into performance practices of this period, and has attracted very good reviews. 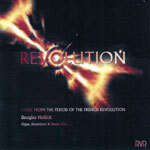 Following this on Riverrun is 'Revolution' (RVRCD 71) - Music from the period of the French Revolution, featuring organ, harpsichord and square piano. 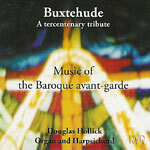 Buxtehude, a tercentenary tribute: music of the Baroque avant-garde (RVRCD 79) recorded on the organ of Trinity College Cambridge and a harpsichord by Douglas Hollick based on the 1638 Ruckers in the Russell Collection. 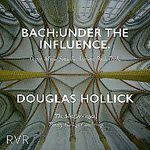 The latest CD, Bach: under the influence (RVRCD 121) was released in late 2017, again recorded on the organ of Trinity College Cambridge, with works by Scheidemann, Weckmann, Buxtehude, Pachelbel, Fischer and J S Bach, based around four ostinato variation works in the Andreas Bach Buch - Buxtehude's Passacaglia, Pachelbel's D minor Ciacona, J C F Fischer's Chaconne, and J S Bach's Passacaglia. Played with flair and conviction ..... this was a jewel in the University early music series. Douglas Hollick possesses a vitality and spirit which brings a freshness to all his performances. His remarkable technical skills and imaginative ornamentation succeeded in restoring to the music that charm which lies beyond the mere notes. The Prelude opened with a brilliantly executed and lengthy passage for the pedals ....... The clarity with which each subject entry was contrived together with the seeming ease with which rapid virtuoso manual and pedal sections were dispatched, added to the excitement of a masterly performance.